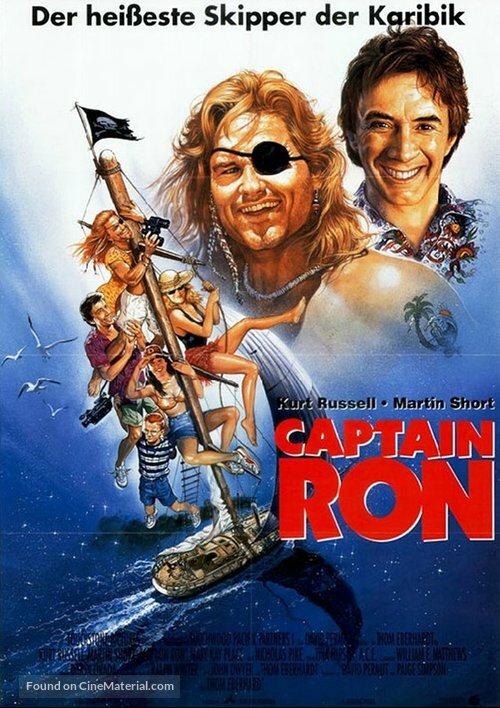 Captain Ron (1992), a warm and quirky family adventure starring Kurt Russell’s next iteration of Jack Burton. MY CALL: An outstanding comedy for Kurt Russell fans, filled with gorgeous shots, positive warm family dynamics, an energized Caribbean soundtrack and lots of contributing to the delinquency of minors. Imagine Martin Short as Clark Griswold and Kurt Russell as much smoother cousin Eddie… and they’re yachting… what could go wrong? 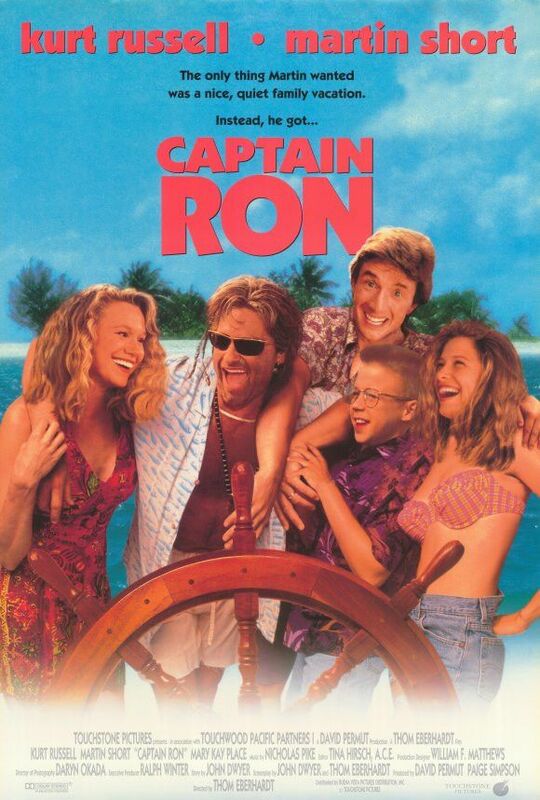 MOVIES LIKE Captain Ron: For more Caribbean movies, go for Cocktail (1988), Club Dread (2004) and The Pirates of the Caribbean movies (2003-2017). As Martin, Martin Short (The Prince of Egypt, Father of the Bride, Pure Luck, Innerspace) plays the typical high-strung, playing-it-safe, upper-middle class father and meeting his Chicago family feels strikingly similar to meeting the McCallisters in Home Alone (1990) as quirky husband-wife, sibling-sibling and parent-child dynamics amusingly wash the screen. When Martin inherits a beat-up yacht in the Caribbean, a company hires a captain to ferry his family to Miami so he can sell it. Kurt Russell breathes charm into a character that, by all means, should be despicable. Ron probably owes money to everyone he knows, he has a history of property damage and philandering and adultery, Martin catches him staring at his wife’s (Mary Kay Place; Big Love) cleavage and hitting on her with every opportunity, he accepts bribes from teenagers (Meadow Sisto; Can’t Hardly Wait) and even tries to hustle money from preteens, he encourages a ten-year-old (Benjamin Salisbury; The Nanny) to drink beer and clean guns, and (when Martin strangles Ron) he reveals that this isn’t the first time a boss of his tried to kill him! Ron clearly has a deep history and we never learn any details beyond the occasional glimmer from a random comment. Big Trouble in Little China SIDEBAR: A frequent discussion point on the Movies, Films and Flix Podcast is the theory that Captain Ron is, in fact, the alias of Jack Burton. Once a passing joke, having watched these films again recently, evidence has mounted. Both characters are promiscuous story-telling grifters who move around a lot, enjoy gambling and, with almost supernatural luck, manage to fail their up—but additionally they both have preternatural lightning reflexes (Jack catches the bottle assault and the thrown knife; Ron catches a fly bare-handed, lets it go and catches it again), both have encountered magic (Jack fought an ancient sorcerer; Ron claims to have encountered Voodoo and Hudu), they rock tank tops and inappropriate attire (Jack in a woman’s bathrobe; Ron in his Speedo) and can’t seem to stay in the same place. Folks, they’re the same guy! Don’t believe me? Then check out podcast episode 50: Kurtchella. Director Thom Eberhardt (Night of the Comet, Gross Anatomy) delivers a warm PG-13 family adventure complemented by gorgeous ocean shots, a warm dynamic and a lovely Caribbean soundtrack. As Martin’s family sands and polishes the yacht, Ron leads them on a series of misadventures. They completely miss Ted’s island and encounter guerillas (not gorillas), they get arrested in Puerto Rico and they get marooned in Communist Cuba after the “pirates of the Caribbean” steal their boat. It’s so endearing as we watch Ron’s off-the-cuff yacht terminology quizzes and lessons turn into the family working together to raise sails and learning to love their boat. They’re no aces at it; instead they credibly but capably fumble through the process with Ron’s direction and, you know what, they (and we) feel great when they do it. This goofy feel-good family adventure film will paste a permanent smile on your face as you watch the oft-serious Kurt Russell kick up his feet and sip his beer during yet another adventure in his odd life. It’s a wonderful way to spend a weekend afternoon. ← John’s Horror Corner: Curse III: Blood Sacrifice (1991; aka Panga), a B-movie featuring Christopher Lee, an angry Witch Doctor and a lame Sea Demon.